After a week full of major saints and prominent names, we’re dialing it back and injecting a small dose of obscurity with this match-up. That’s not to say that John Cassian and James Lloyd Breck are lightweights, they just don’t have the name recognition of some of the contenders vying for the Golden Halo. Will the monastic carry the day or will he wander around on his hands and knees futilely seeking an oasis in the desert of Lent Madness? Or will Breck, like Philander Chase before him, rally Midwesterners and seminary alumni to his cause? In yesterday’s action, Dietrich Bonhoeffer swept to a resounding victory over the apostle James, leaving members of Jesus’ inner circle (Thomas then James) to wonder just where they went wrong. Don’t forget to check the the updated calendar of match-ups and the updated bracket. John Cassian (360- c.435), considered a saint by the Eastern church but never canonized by the Western church, was a Desert Father who championed monasticism as a spiritual way of life. He was a follower of St. John Chrysostom who ended up in Rome as an emissary to Pope Innocent I for that exiled Patriarch of Constantinople. When invited to establish Egyptian-style monasteries in Southern France, Cassian did so for women as well as men. His writings, Institutes of the Monastic Life and Conferences on the Egyptian Monks greatly influenced St. Benedict whose Rule has shaped Western monasticism for centuries. It is said that Benedict insisted that sections of the Conferences be read aloud to his monks. Cassian outlined three stages of monastic life. Young monks concentrated upon prayer and ascetic practices in order to take control over the flesh. This period of purgation often lasted years as the monastic came to identify with Christ’s temptation in the wilderness. In the next stage, the monk took on a teaching role by encouraging others in the faith, showing hospitality, and becoming connected to Jesus through the Sermon on the Mount. Finally, elderly monks often fled into the desert to obtain union with God through solitude. This last stage saw monks identifying with the Transfigured Christ. Cassian died in 435 and is recognized in the calendars of the Eastern Orthodox and Episcopal Churches on February 29th — a date that only arises every four years. Collect for John Cassian: Holy and Mighty One, whose beloved Son Jesus Christ blessed the pure in heart: We give you thanks for the life and teachings of John Cassian that draw us to a discipline of holy living for the sake of your reign. Call us to turn the gaze of the eyes of our soul always toward you, that we may abide in your life, shown to us in our Savior Jesus Christ; who with you and the Holy Spirit is one God, living and true, to the ages of ages. Amen. 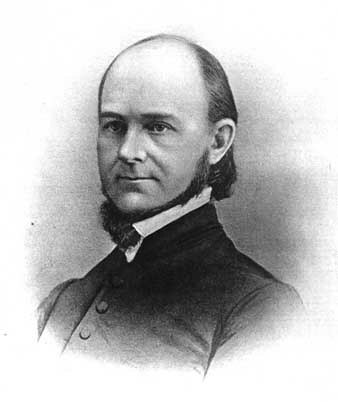 James Lloyd Breck, “the Apostle to the Wilderness,” was an indefatigable establisher of institutions, including Nashotah House and Seabury Divinity School (now Seabury Western)—Episcopal seminaries to this day—as well as the first Native American missions west of the Mississippi and the first Episcopal Schools in California. 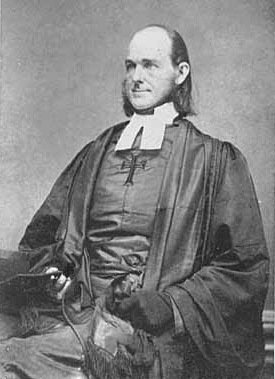 Born in Philadelphia in 1818, Breck attended General Seminary in New York. Responding to the call of Bishop Jackson Kemper (feast day May 24), Breck and two classmates journeyed to the frontiers of Wisconsin in 1841 where they established Nashotah House. In 1850, Breck headed to St. Paul, Minnesota to begin another training institution; when that venture failed, he turned his attentions to establishing missions to the Chippewa and Ojibway (guided by fellow Lent Madness competitor Enmegahbowh). Threats of violence forced him and his family to leave the second mission after only eight months. After a trip East for fundraising and recruitment (Breck was also an amazing fundraiser, sending a constant flow of letters to donors), Breck boarded the Henry Chauncey, along with his children and second wife, and headed to California. There, he established St. Augustine’s College with a boys’ school, a girls’ school, and a theological college, and served St. Paul’s parish, Benicia. On March 2, 1876, Breck fainted while saying Evening Prayer at the school chapel. He died soon after. Although originally buried in Benicia, 20 years later his remains were moved to Nashotah House where they are to this day. Collect for James Lloyd Breck: Teach your Church, O Lord, we pray, to value and support pioneering and courageous missionaries, whom you call, as you called your servant James Lloyd Breck, to preach, and teach, and plant your Church on new frontiers; through Jesus Christ our Lord, who lives and reigns with you and the Holy Spirit, one God, for ever and ever. Amen. 62 Comments to "John Cassian vs. James Lloyd Breck"
This is a no-brainer, but then again, I went to VTS and am an east coaster in my formation, so these midwest educational types mean little to me. Education helps us rise beyond our geographic limitations and “types” thinking, to go where we are called. James Lloyd Breck. Because he went where he was called. This is another tough one. I’ve always been a fan of James Lloyd Breck and his mission in the west (I’m a far westerner by birth and became an Episcopalian under clergy schooled at Nashota and SWTS, and did my DMin at SWTS). However, the importance of John Cassian in the development of monasticism, and especially his influence on early Irish monasticism (a subject dear to my heart), is going to trump American Anglican history today. St. John Cassian left one of the deepest and richest spiritual legacies in the history of the Church. Go Cassian! Cassian FTW. John Cassian was one of the main exporters of Egyptian monastic ideas to Europe, and we all know that monks are the awesome. Did you enjoy The Name of the Rose? Do images of bookish monks with their heads bowed in prayer warm your heart? Do you sip chartreuse occasionally? Thank John Cassian! Also, his Conferences are a hell of a read. Cassian sure has a golden halo around his head! Skye’s turn today — she is home sick from school so has had lots of time to ponder the candidates. She casts an enthusiastic vote for Cassian. Why? She thinks his life experiences sound really cool, actually really hot, being out in the desert so much of the time. Plus, that halo in the picture looks really golden…..
It’s funny to see what criteria children use. My older one is most interested in voting for a “girl,next criteria: gruesome death. My younger child is a bit more well-rounded. Neither of them really pays much attention to the picture, though, except to note if it’s recent enough to be a photograph. They haven’t looked at today’s match-up yet but I bet they are going to go for Cassian. A little proof-reading of John Cassian’s Collect is called for. Not an easy pick today. I am continuing my streak of voting for these Episcopal missionary pioneers. Without Breck’s work, the Episcopal Church would be a regional church. Plus, I have friends who worship at St. Paul’s Benicia. Still a thriving parish of the Diocese of Northen California. If Benedict is the father of western monasticism, Cassian is surely the grandfather. Even Breck owes much of his success to Cassian’s coaching. Go John! I excitedly voted for John Cassian when I saw he was the Dessert Father. What’s that? He was a “Desert Father”? Never mind. I never really understood the power of JLB’s work until I moved to Minnesota. As someone earlier said, our American Episcopal Church might be a regional church (east coast!) without his, and other missionaries’, work. He went where he was called. I have to say Breck as well. Go west young man and teach the Gospel and tell the truth. I am going for Cassian today – he was an early champion of women by setting up monastaries for both sexes…..
Fundraiser, early Episcopal Communicator . . . got to go with Breck! I went for the Breck-en-ator. He seems over-qualified and I like his bravado in face of loss. Also, I’m a fund raiser too, so there is this soft spot in my heart for my fellow pesky pesterer of people for money. Go Cassian! The major reason he got put on February 29th is that he fought with Augustine over predestination. He felt that Augustine’s teaching in favor of predestination would lead people to assume that they’re actions didn’t matter (and so would feel free to behave badly). Cassian lost that fight and so he, or at least some of his books, was condemned as semi-pelagian. His monastic books were to important to be dropped, however, so he tended to be studiously ignored outside the monasteries. As a cradle to grave Episcopalian (not that I’m in the grave yet!) I’m voting for Breck. The Episcopal Church is AWESOME! Am I right???? Go Team Epi! Breck for sure. While in Saint Paul, MN he WALKED to Gull Lake–a matter of 150 miles by today’s roads–to chat with Hole-in-the-Day, chief of the upper Mississippi Chippewas. Hole-in-the-Day was out, so Breck turned around and walked back to Saint Paul. The man was an indefatigable disciple for the Lord! I wish we’d had Cassian up on his feast day since it only comes every four years, unless transferred. This was a tough one. I was drawn to John Cassian but voted for Breck in honor of St. Paul’s, Benicia, where I trained while in seminary. As a graduate of Breck School in Minneapolis, I have to vote for Breck! How about calling that Alum association of yours? 🙂 If Kenyonites can do it, why not the Breck School? I was born and raised in Minnesota. Please could someone post it? I spent two years as a troubled pre-teen and teen ager at Kemper Hall in Racine, WI where the Episcopal Sisters of St. Mary quite literally saved my life while my parent’s marriage was breaking up. I studied at Nashota House while I was a member of All Saints Cathedral in Milwaukee. I have lived in Wisconsin for more than thirty years and now reside in Northern Wisconsin (with plans to retire to Florida). Although Cassian is very important, this is easy for me. In my heart, I am a monastic. (not so much in practice!) So, my vote goes Cassian. My affinity for Native Americans and Breck’s work with them, along with his apparent tendency to understate (“I should think it a good time for me to emigrate to the West!”) while under tremendous stress put him over the top for me, though I have to agree, “Dessert” Father Cassian” makes this a difficult choice! While I wish the blurb was true- and that SWTS was still an seminary- it was, in its day, a great place- not least as the first Anglican Seminary to have daily eucharist- Breck was an impressive man and, like a few others we’ve seen, a great example to a church facing a serious need for growth – in numbers and in depth of theology and sacramental spirituality- so this one is easy. I’m a sucker for the Eastern Saints. Go John Cassian! Although John Cassian is deserving of the golden halo he is already sporting, as a daughter of Nashotah House and a devotee of the “Black Monk” Halloween HayRides (an earlier, friendlier house to be sure), I had to go with Breck today. If Kenyonites can do it so can Nashotahites! ON NASHOTAH! Though Breck fans make a good case for the missionary, and if it were Tuttle, I’d be in a pickle, I have been sharing this site with nonAnglican friends, and am embarrassed that Chase beat out Merton. Team spirit has its place. But really. So I’m going with the monastic today. Way before the time of the Episcopal Church, but the spirituality of the desert fathers and mothers is part of our DNA. Without it, we’d be little more than the offspring of the 16th century rise of nation states. “an indefatigable establisher of institutions” eh? I’ll vote for the other guy. Breck. I have a soft spot for Episcopal seminary founders. Great game. Very informative about things I never would have had time to think about. Thank you. One little point concerning James Beck. He may have been the first Episcopalian missionary to across the Mississippi, but there were multiple Catholic Missionaries prior to this in the midwest as well as all of the Franciscans in the Southwest 100+ yrs earlier. Point well taken. But when Beck showed up in Minnesota, there had already been an Episcopal presence in Minnesota for a decade. Tough call but I’ll have to cast my vote for John Cassian. Without the desert fathers, we wouldn’t have very much, after all. And missions have not always been the most loving places for native cultures, despite the best of intentions. I must admit to being somewhat confused at to the nature of people’s choices, which, with just a few exceptions, seem to privilege the Episcopalians over the non-Episcopalians, and to view early Christian saints through 21st century eyes and thus the modern folks over the ancients. My bracket has been on the losing side for almost every single match up. Although I admire the missionary work of James Breck, needless to say, I’m voting for John Cassian. Did I forget to include a picture of him when I sent the bio??? How embarrassing! I have not weighed in about anyone — even Enmegahbowh — yet, but I feel I must speak up for James Lloyd Breck. He was the founding Rector of a parish I once served (All Saints, Northfield, MN). However, many other Minnesota parishes also claim that because Breck rode a circuit of churches (I just “rode” to two). He was tireless in pushing to find ways to spread the faith of Jesus. He was constantly pushing to the frontiers of his comfort zone — something most of us rarely do. My vote is not against the eminent Cassian — who equally deserves praise — but for Breck who needs to be part of our ongoing corporate memory and praise. The notion that Feb. 29 onl comes every four years is a reflection of Cranmer’s (over)simplification of the calendar. Before 1549 liturgical calendars, Eastern and Western used the classic Nones, Ides, Kalends system and the last day of February was always the day before the Kalends of March. Leap years were called bisextile (because the 6th day before the Kalends (the 24th/25th) was counted twice in leap years so the feast of St. Matthias was moved up to the 25th and the following holy days were also moved ahead one day. Thus Cassian’s feast was observed on the last day before March. Interestingly the civil Gregorian calendar did use a Feb. 29 from early on, (as did post-1549 England with the Julian) but most liturgical calendars retained the bisextile (and indeed the BCP retained the term bissextile format long after changing the presentation of the calendar).. In an earlier contest, there was a complaint that the voting reflect a mid-west Anglican bias. Oh well, guilty as charged. Breck should be the patron saint of church-planting. He must have founded half the churches in Minnesota, not to mention Wisconsin, Illinois, and California. His work with Native American was far-reaching. I have great love for the desert fathers but Breck it is. I voted because it’s now a habit but not too much about which to get excited. Note that my spelling may be off…..sometimes…but not my grammar ! Breck–ho-hum; not into the monastic life as with Cassian. Nashotah House….sooooo conservative, yet highly respected and Seabury Western…reputable…(Yawwwwwwwwwn !!!) Need exciting choices . This is an easy vote, Cassian for sure. The desert monastics knew how to experience the holy, rather like direct solar energy, with no need for intermediaries, yet a strong need for lengthy practice, inner discipline, and a profound commitment for the long haul. We need this energy in our seriously off-kilter world! No, not the tried and true favorites today. I’m embarrased to admit, I didn’t know who either of these dudes were! I do now, and, of course, went the education route. I always go for the monastic. People seldom realize that there were desert MOTHERS along with the desert fathers. Thank you John Cassian. Also I like that he is a saint of the Orthodox Church and not of the Roman. Points upon points IMO. Also Breck school wins too many championships in Minnesota. 🙂 Of course, I am truly grateful for all that Breck did for Anglicansim in the mid west. If I were a native Minnesotan, I might vote differently. But this is a Saintly Smackdown, not a regional tournament. Right? Thanks for fixing the typos in the Collect. This ol’ English prof feels better now. “I should think it a good time for me to emigrate to the West,” is a brilliant line. Whether or not it was intended with the kind of deadpan delivery I like to imagine, I’m going with Breck. Gotta love a man who set’s sail for California, around Cape Horn, with family in hand. Vote Breck! John Cassian’s hermitage order developed pious monks. James Breck developed seminaries and, also, schools for children. Episcopal schools laid both an educational and a spiritual foundation for future Christians. I’m highly in favor of Christian education. Viva Breck! For missions and schools risked his neck. I guess he’s the one who is inspiring me more today, and as a fellow educator, my vote’s for him. Perhaps some sleep will bring forth a poem for John Cassian? Breck has my vote. Schools for Native Americans and schools for girls in a time when these were on the outside of society. Cassian, only because I am a member of a religious community with Benedictine underpinnings…. 1 Trackback to "John Cassian vs. James Lloyd Breck"